Watching the Charles Cramer series of videos here on Luminous Landscape was both tremendously educational and inspiring. It made me want to have another look at some of my images and see if I could tweak them using his techniques to produce better prints. However, there was a rub: I didn’t have the same post-processing software as Charles used in the videos. To briefly summarize his workflow, he does most of his editing of the raw file in Lightroom and then exports the image as a smart object into Photoshop which he finds better suited to do the small tweaks and corrections that make his final prints so wonderful. This is all well and fine if you have the Photographer’s Plan under the Adobe Creative Cloud. I don’t. I have perpetual licenses of Lightroom 6.14 and Photoshop Elements 2018. Could I make these two applications work? 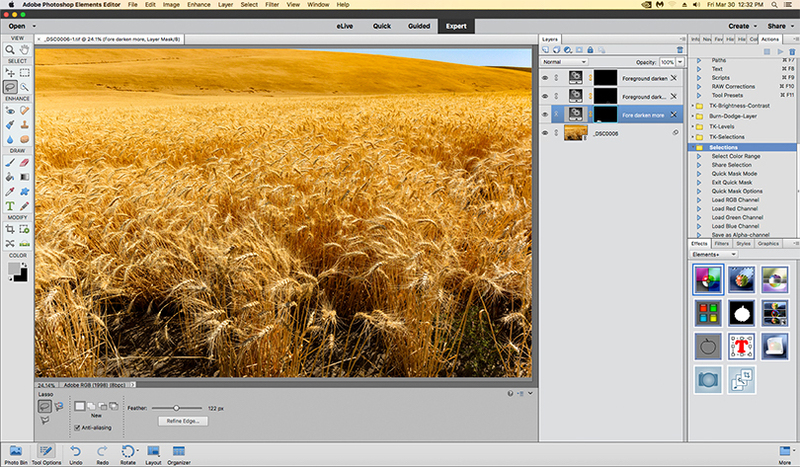 Photoshop Elements is a stripped down version of Photoshop which has some of its features removed or at least hidden and is limited in many of its tasks to 8-bit images and either sRGB or AdobeRGB color space. You can’t create a smart object in Elements and critical items such as Curves and selection by color range are not available. Some Photoshop actions are supported but you cannot create them within Elements. Adobe Camera Raw is included but its functionality has been severely limited and only the Basic, Detail and Camera Calibration tabs exist. At first glance, this does not look promising. Enter Elements+, a $12 add-on program produced by Andrei Doubrovski, which makes available hidden and undocumented features of Elements. Under the hood Elements contains the same basic processing engine as full Photoshop, it’s just that it lacks a menu item to get to certain features. Elements+ provides a menu item for Curves for instance. 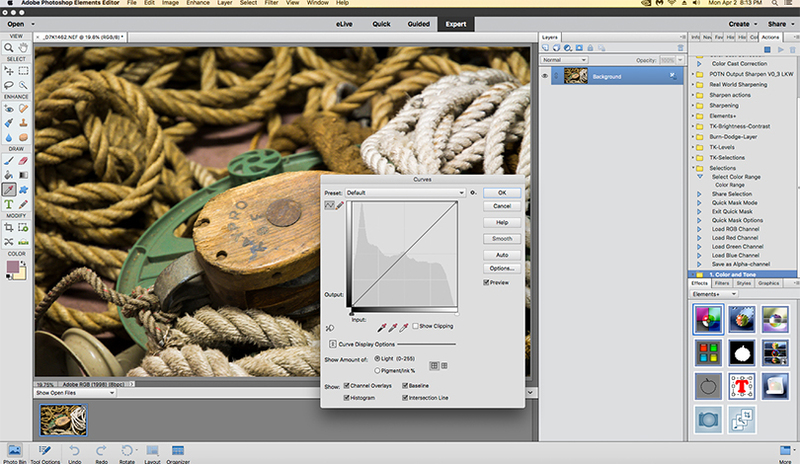 Clicking it creates an adjustment layer with a mask and brings up the same familiar Curves panel you find in Photoshop. If you have made a selection prior that will be incorporated into the mask. The current version of ACR in Elements 2018 is 10.1, the same version that is in my Lightroom 6.14. Elements+ includes a feature called Raw Corrections which enables most of the missing tabs in ACR. It even includes dehaze which Lightroom 6 lacks. Notably still missing are radial filters and adjustment brushes. Another minus is that the preview window in Raw Corrections is not color accurate but you can switch back to the standard ACR window to view the true result of your adjustments. Now here is the interesting part: in Raw Corrections there is a checkbox “open as smart object”. You need to have the 8-bit output selected in ACR to see this but once you click “OK” your image will be converted to an embedded smart object. Once you have a smart object you can apply smart filters. Plugins from AKVIS, Imagenomic, Nik, ON1 and Topaz will function as smart filters. Once applied, later on, you can edit their effect. 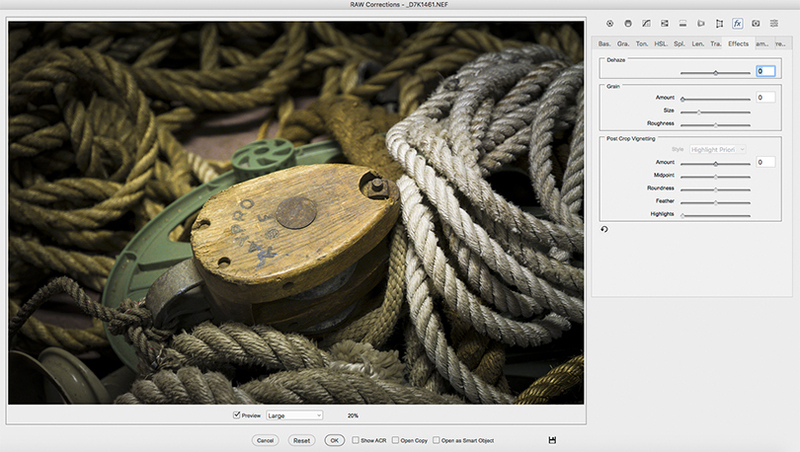 Similarly, adjustment layers can be edited. The layer will actually show the slashed pencil which normally means it is uneditable but Elements+ provides a menu item to overcome that. There are two other ways to create a smart object. 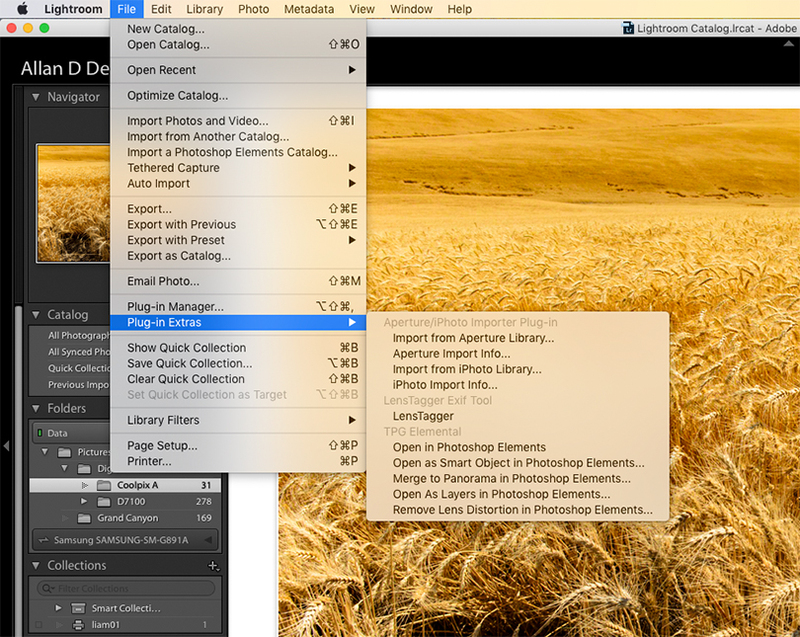 Let us suppose you do your raw file editing in Lightroom. Go as far as you wish with it and switch to Elements (and I’m assuming you are making an external xmp file in LR). Then you can open the same file, find all your LR edits intact, and convert it to a smart object using the Elements+ menus. There is also a neat donationware LR plugin called TPG Elemental that allows you to export a smart object directly to Elements. 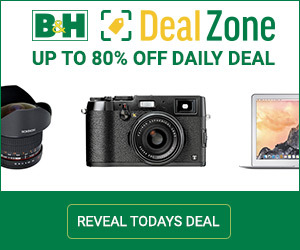 So what about the limitations of bit depth and color gamut? 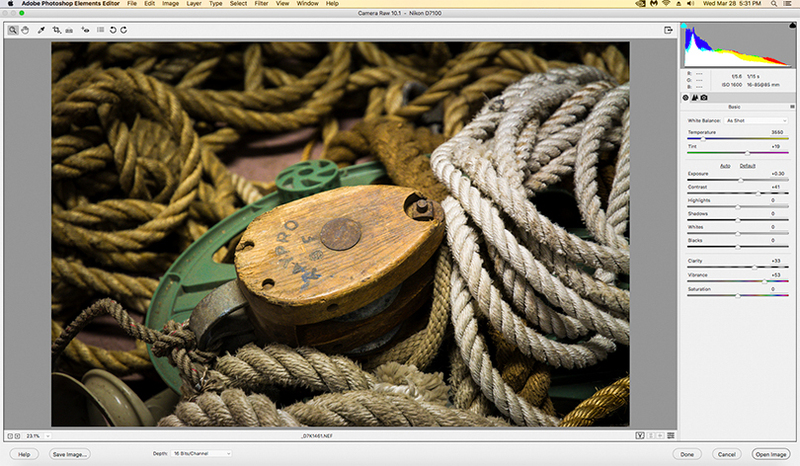 Remember, both in Lightroom and ACR you are working in high bit and wide color gamut. Assuming you do the heavy lifting there and are only doing minor tweaks of color and tone in Elements, I don’t believe, in most cases anyway, you will see banding or other problems. The beauty of the smart object is that you can always go back to the raw file and high bit depth, wide color gamut and make changes there. The image will then be re-rendered back into the smaller space. Then you only have to determine what compromises you are making sending an 8-bit AdobeRGB file to your particular printer. My printer is an Epson Stylus Photo R3000. I’ve made my own custom profile for it and made prints from the printer gamut test files from Digitaldog. I see minor differences in the test image prints but I do not see meaningful differences in my own prints made from AdobeRGB files vs ProPhoto files. Of course, everyone has to make their own determination about this. So, for me at least, the answer to my question is yes, the combination of Lightroom and Photoshop Elements, enhanced with Elements+ and TPG Elemental allows a very satisfactory implementation of the Charles Cramer workflow.